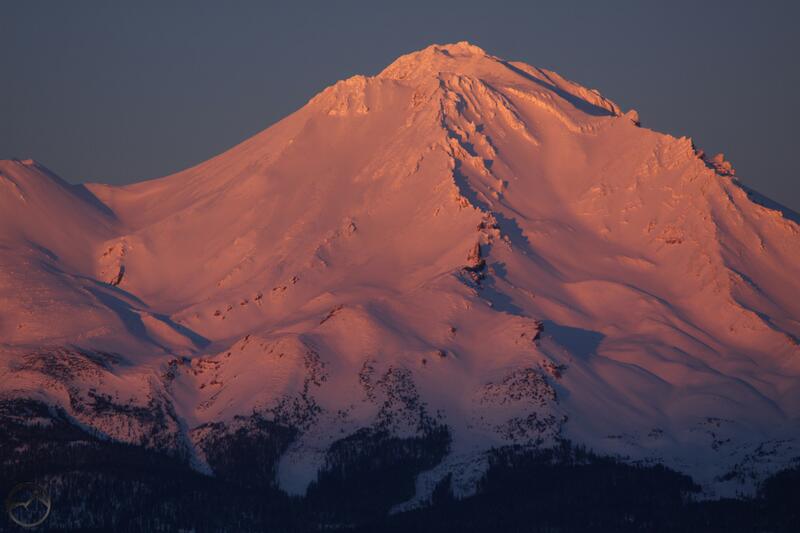 At a lofty 14,179 feet, Mount Shasta is one of the tallest mountains in the American West. It is a grand volcano, soaring over 5,000 feet above the tallest neighbor, and presides majestically over northern California. Flanked by the Klamath Mountains on the west and the Cascade Crest to the east, the Mount Shasta region offers numerous exceptional hiking opportunities, both on the great mountain and in the ranges that surround it. Whether one is looking for wild hikes with crashing waterfalls and massive glaciers or the quiet solitude of alpine lakes and meadows, the Mount Shasta region offers spectacular hikes that will challenge and satisfy hikers of all skill levels. Hikemtshasta.com strives to be the most exhaustive, complete resource for hiking trails in the Mount Shasta area. I hope that you will find it useful for planning a trip to the area or that it will lure you to explore the area further! Please feel free to leave comments on the appropriate trail pages if you have hiked the trail and enjoyed it or if conditions have changed and the page needs to be updated! Please visit hikemtshasta’s Facebook page to receive updates on new trails added and other material being added to the site. **I am still very happy to answer questions of any reasonable type. However, due to the volume of queries I get, hiking questions will be prioritized over those concerning camping. I may not be able to address all inquiries regarding where to camp or things of that nature. Hopefully this will not significantly inconvenience anyone. Wow, what a great local hiking website! Congrats and best wishes on your soon to be released hiking guide for the Mt. Shasta region. And thanks for dropping by my site too (http://tucsonhikes.wordpress.com/). Take care and enjoy the beauty of your region of the country, as I do the Southwest. I appreciate your kind words. I would love to publish all this stuff, but who knows. I am a huge fan of the southwest and I am always glad to find good sites on that part of the country so I can travel vicariously. I love Cafe Poca Cosa too, for what it is worth. Best Mexican food I have ever eaten. What a great site you have put together. I hike all over the North State and now have a new place to find hikes. Your photos are beautiful too. One question – are the total miles round trip or each way? Thank you for all your hard work! Thank you very much for the comment. It is sincerely appreciated! Regarding the mileage, it is all given round trip. I hope the site helps you find some awesome place you haven’t been to before! thanks for giving it all away!!! What exactly are you concerned about being given away? Typical siskiyou county native who resents or doesn’t want any or many people in Their outdoors. Though I frequently feel same way when I grew up about Sierra’s. Also was hiking n backpacking at early age only was early 60’s. People would jump out at this girl leading midget mule when we come out from week trip. Was very few people that now are popular. Wagon creek had few no trespassing signs. One clearly meant it. What a wonderful asset you have built here! I do weekly day hikes around the DC/MD/VA area and in the Shenandoah Mountains, and thanks for visiting my blog to read about one of them. They are nowhere near as serious an undertaking as hiking around Mount Shasta would be! If I ever travel to the Mount Shasta area to do some hiking, this is definitely THE go-to site to prepare for the expedition! Thanks again & all the best! Best website I’ve found, by far, for Northern Ca hiking trails. I’m so glad it came up in my search results. My husband and I are always looking for local hikes. Thank you for this great resource! Please add a link on your Gravatar page that leads readers to your blog. I had to Google you, and then I found you in a WP support forum. And, here I am. Thanks for visiting my blog! Thanks for the effort to find my site, it is much appreciated! I thought that I had a link on the gravatar. I went back and added it again, so I think it should work now. From my phone, I was linked straight to your blog from your Gravatar icon in my notifications. Last night, I was on my laptop. When the distance says “total distance” do you mean one way, or round trip? The whole thing, whether it is a loop or out and back. Total at the end of the hike. Thank you for this amazing resource. We will follow your site and definitely use it when hiking the area. Will add Mt. Shasta to our itinerary when we return from AK this year! Thanks for stopping by my site and leaving your message. I was also banned from the forums. As Winston Churchill once said, “You have enemies? Good, that means you stood up for something in your life.” Bottom line is, i don’t need any social, political or religious issue shoved in front of my face like that. WordPress has lost my respect. Did they tell you why you were banned? I got no explanation other the “you violated community standards”. I have asked for elaboration and gotten none. I was not even making an issue about the rainbow banner. I was largely complaining about their response. Watch out for totalitarians! I am assuming it was because i posted to often about the same subject. Funny that they don’t like “spam”, but they are okay with putting up the rainbow banner on everyone’s site. Is that not “spam”? Bunch of hypocrites if you ask me. Man, I only posted two or three times. They are seriously behaving like fascists. This is a scary new age we are moving into. I hope sanity will prevail and end this type of cultural authoritarianism. You are right. I find it unnerving that the young generation these days seems to jump on any “social bandwagon” out there and don’t think hard about what they are actually supporting. If it’s on social media and the flavor of the day, let’s jump on it. If you run contrary to what they believe, you are labelled with such words as bigot. It seems like going against the mainstream and traditions is the norm these days. I simply don’t want my site politicized in any way. I am not excited about where this leads. Watch your back, and I guess watch what you say. Hey, thanks for finding me & liking my post about Great Basin Nat’l Park. We have passed through Shasta many times. One of my favorite plant nurseries is at the entrance to the city park with Sacramento River headwaters coming from the rock. Now I know where to look for day hikes, am looking forward to going there again. Great site! However, the directions to Gateway Trail are wrong; they took us to the Black Butte trailhead. But Google Maps set us on the right path. Are all of these trails open in the winter time? I am looking to hike the Brewer Creek and Ash Creek Falls trails this weekend and just wanted to make sure all of the roads to them and the trails themselves are accessible. Thank you! Definitely not open. There may be only a little snow out there, but those trailheads are not accessible this time of the year. Do you know if Sheep Rock near A12/Highway 97 has a trail? It does not, but the route is pretty easy to follow. Most of it is on BLM land. Would you have any information on the route to the elusive Coquille Falls on the northface of Mt Shasta? There are a couple of ways to get there. Both involve rough roads. The most direct way but more remote and with worse roads is to come from the south. The other option is longer but the roads a bit more reliable, which is to hike in from the North Gate trailhead. Pass the North Gate plugs and continue toward Bolam Creek. It is pretty straightforward. It is a beautiful spot! Can you create a category of trails by difficulty? Can you suggest any easy trails? We have done the Sacramento River trail near Dunsmuir and the Lake Siskiyou trail. Any other easy ones?